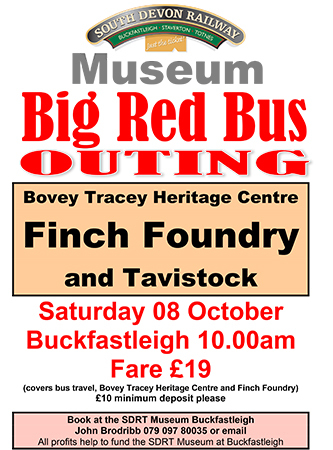 The SDRT Museum Group’s next Big Red Bus Excursion will be on Saturday 08 October, and will leave from Buckfastleigh station forecourt at 10.00am, as usual. We will call first at the Bovey Tracey Heritage Centre, which is in the old station there. For SDR people it is of particular interest, as the building is the twin of Buckfastleigh station, albeit before the latter was extended in 1906. We then go on to Finch Foundry at Sticklepath, where there are working water wheels, forges and a huge amount of industrial archaeology; all dog-friendly. Lunch will be at the Taw Valley inn, across the road. We then go on to Tavistock, arriving in late afternoon, and back to Buckfastleigh by about 7.00pm. Bookings via the museum please, as usual.